Peach and Thistle: Ireland! 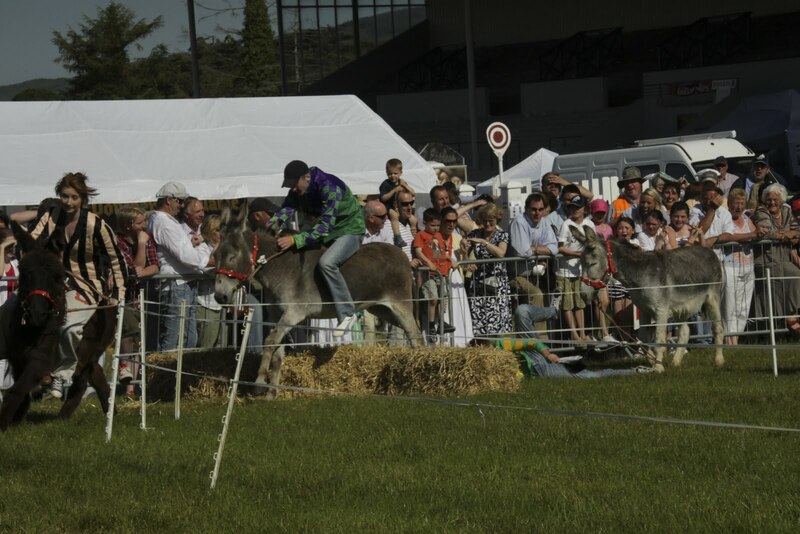 Donkey Derby!! When I was in Atlanta recently I got together with an old friend of mine. 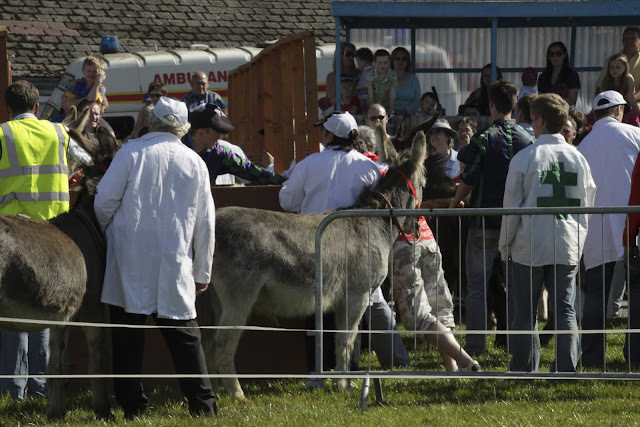 I met her brother-in-law, who is from Clonmel, and he told me about the Donkey Derby. Since it was coming up, I decided I had to go and see it! This was definitely the main event of the day! 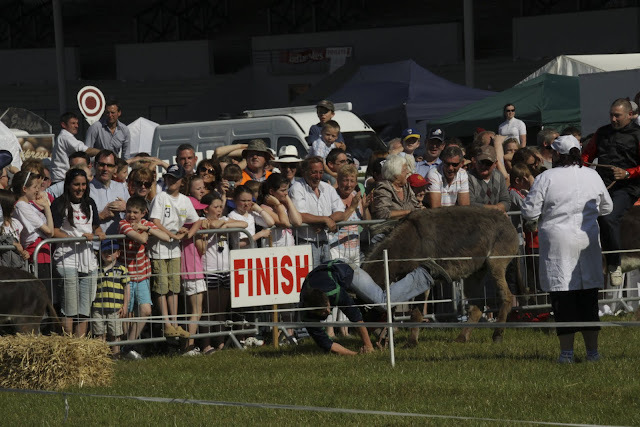 Wrangling the donkeys into the starting chutes was an event in itself. They're off! The Derby consisted of two heats of two laps each followed by a two-lap final race. The first obstacle on the course is this hay hill. Remarkably, the first heat's riders all seemed to cross it unharmed in their first lap. The second obstacle- a simple hay jump. oops! He lost his ride! Some riders didn't do much riding. The girl in the cream and black striped jersey had a donkey that was rather slow. Luckily for her, in the Derby, slow seems to equal staying on your mount! Her expression cracks me up! The exhausted first heat contestants looked on. I absolutely love the real rider observing in the background. This looks almost like a real race! Oh, nope. It's still the Derby! They're unseated. I think this rider's just given up! This is the final heat. 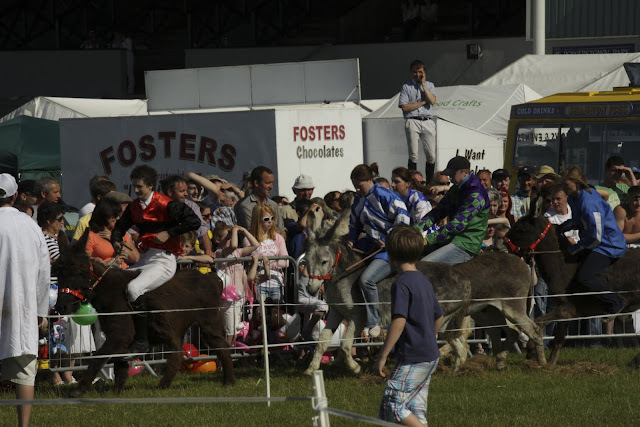 I think the girl in the striped jersey got a faster donkey. The horserider is still hopelessly perplexed. And... it's all fallen to hilarious shambles!! I have no idea who won the Derby race, but I'm pretty sure the viewers were the real winners!